I'm here at Jocelyn's softball game and so far her team is up 4-1. Let's hope it stays that way. She's a part of one of the law school's intramural teams. They play every Saturday. I think so far they've won 2 games. It seems the less they practice, the better they are on game day! Well, I spoke a little too soon. They're on the field and the bases are loaded. So an update (finally) on what is going on with us. I'm really enjoying teaching at Lindenwold. for the most part the kids are great and hopefully I've been able to convey that I care and really want them to do well in math and in life. I've been staying every day on Tuesday and Thursday after school for tutoring and have had some students show up. I'm also staying in the media center (a.k.a. the library - oddly enough there aren't as many books there as you'd think should be there. I swear Pearce middle school had more books than LHS) every wednesday with the French teacher so students can come in and write papers, do research, and do homework. Two teachers stay in the media center every day after school to help out. I've also been getting used to switching rooms for my different classes and the 47 minute classes. My 4 main classes (two Geometry and two Honors Algebra 2) are in my room, but my two study skills classes and my front desk duty are elsewhere. Thank goodness for PowerPoint and my USB drive. I don't think I could do it and be sane without it. Joce and I went to Lindenwold's 2nd football game the friday before last and it was fun. They played Collingswood and almost pulled through. It was definately a small town affair and social time for the students . We made sure to let the superintendent and the principal see us there to get good bonus points. The band is pretty small and the drumline consists of only 3 students, but they sounded good. I've been talking to the hopefully-soon-to-be principal (right now we have an interim principal) and he wants to really get a drumline started. One of my students that's on the drumline is also interested. He said that the numbers in band have gotten smaller in the last couple of years. It would really be fun to be involved with getting a drumline together. I was telling the principal-in-training about how my drumline in high school would walk through the hallwas of the school playing cadences after the morning pep rallys. He was real excited about that. He was a former trumpet player in high school so he knows how awesome band geeks are! I'm also now one of the teacher sponsors of the Leo Club (part of the Lions Club) that meets every 1st Wednesday and does service projects and such throughout the year. They don't have a web site or anything, so I might be able to help get something like that started. We'll see. But overall, I'm enjoying my new job and getting used to New Jersey. Oh, also the attached picture is from when Jocelyn's sister came in to visit a couple of weekends ago. 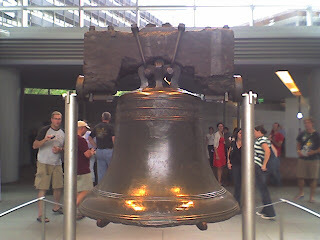 We went into Phila and saw the libery bell up close. It was really cool. The wood on the top of the bell is so old, it looks petrified. So now after writting this at Jocelyn's game, it looks like it's taken a turn for the worst. The other team is up a good number of runs, but Joce had some great plays and it's all just for fun. I'll try to update this more often, especially since I can do it from my phone, but who knows if i'll actually stick to that.